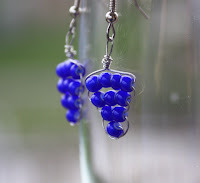 Grape Bunch Earrings: are so much fun! I even have my own pair. 1)Apply to be a part of the Wychwood Market I am! Come by July 25, Sept. 19 or 26! 2)Experiment with product photography (create a lightbox or take photos outside). I've re-added this because I still want to do more with it. And see above about it counting. I've been taking all my pictures outside recently. Can't beat natural light. 3)write out my business plan. This goes back to the strategic goals - I think I'd like to have a map somewhere. 4) Get my accounts in order for 2009. I just did my 2008 taxes. There was swearing. 1)Get my accounts in order for 2009. 3)Keep blogging and posting one item a week. The number of goals seems to be going down as the months pass. I'm not sure if that's because they're bigger goals, I'm just lazy, or I'm being more realistic about my time. I guess we'll see in a month! *also, I'll be posting photos soon from the Alt's Midnight Market! It was a great time. I bought a watch for my boyfriend at this online store.Replica Breitling Watches The watch runs on time, the quality is very good,replica Breitling colt the style of the watch is very like, it is worth buying.